Ron Lewis Chrysler Dodge Jeep Ram Pleasant Hills began as Pleasant Hills Chrysler Plymouth way back in 1978, located on Route 51 just past Century III Mall. We are celebrating 40 years serving Pittsburgh as part of the Ron Lewis Automotive Group! We’re pleased to offer our customers a full service body shop that can repair any make or model. In addition, each service visit includes a complimentary car wash and vacuum. We are one of 3 Chrysler Dodge Jeep Ram locations in the Ron Lewis Automotive Group. Collectively, we sell more Chrysler, Dodge, Jeep and Ram vehicles than any other dealer in Western Pennsylvania! 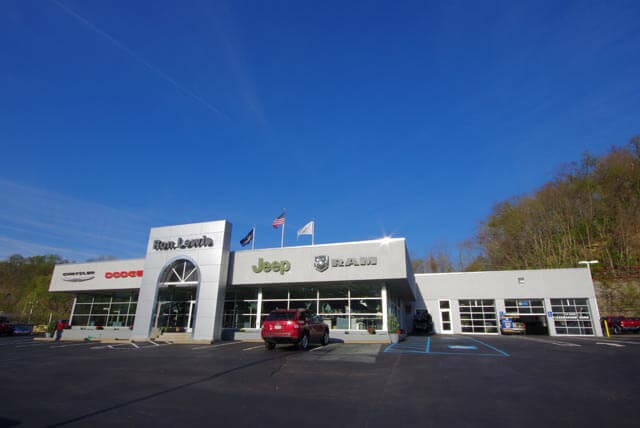 Ron Lewis Chrysler Dodge Jeep Ram Pleasant Hills is also an official Ron Lewis Automotive Group “Souped Up Jeep” and “Souped Up Truck” destination for customizing any new or pre-owned Jeep Wrangler or Ram truck. Ron Lewis Chrysler Dodge Jeep Ram Pleasant Hills began as Pleasant Hills Chrysler Plymouth way back in 1978, located on Route 51 just past Century III Mall.